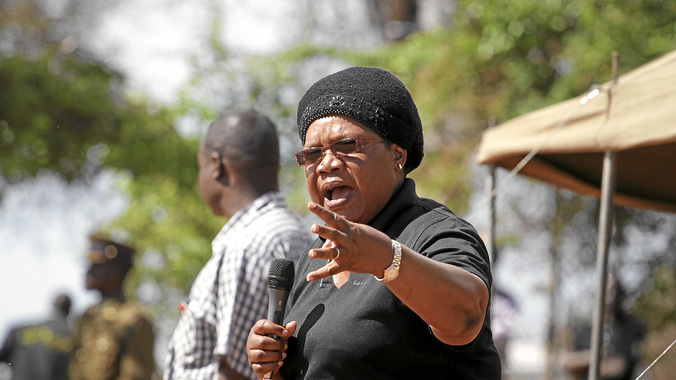 Former Vice President Joice Mujuru has laughed off what she says are “desperate attempts” by President Robert Mugabe’s deeply-divided Zanu PF to silence her and other opposition parties through the continued use of thuggish tactics. As the clock ticks inexorably towards what promises to be watershed national elections in 2018, the Zimbabwe People First (ZPF) leader also declared defiantly yesterday that she would stand toe-to-toe with Mugabe and Zanu PF in the run-up to the eagerly-anticipated polls. Her comments — delivered to the Daily News via her spokesperson Rugare Gumbo — came as Zanu PF was being fingered by the Zimbabwe Peace Project (ZPP) and other human rights watchdogs as the main player and instigator of violence in the country. For example, the latest ZPP report revealed that in March this year, Mujuru’s new political outfit was at the receiving end of numerous Zanu PF-orchestrated violent attacks. “Zimbabwe Peace Project reports for March show a total of 123 violations which had 318 victims altogether. Of these victims, 35 people (11,6 percent) were from ZPF, which is a significant increase from 18 victims in February (4 percent of the total 441). “While the number of victims for March in general was less than that for February, for ZPF the number of victims doubled,” ZPP said. Apart from having to endure these attacks on her supporters, Mujuru herself was last week blocked from addressing a church gathering in Chinhoyi by suspected State security agents. It has also since been claimed that the security officials involved allegedly went on to abduct a Salvation Army pastor from the area, before releasing him after strongly warning him never again to invite Mujuru to such a gathering. But speaking in an interview with the Daily News yesterday, Gumbo said whatever thuggish methods Zanu PF would adopt and use against opposition parties, the “struggle for people’s emancipation will not stop because of the dirty tactics”. Asked how Mujuru was taking the ongoing attacks and harassment aimed at her and her supporters by her former Zanu PF colleagues, Gumbo said she was “laughing it off”. “She (Mujuru) just laughed it off. She said these people do not know what they are doing. They do not know the meaning of freedom and that of freedom of expression. She is very relaxed about the issues,” he said. Gumbo said the Chinhoyi meeting had been “an innocent gathering” that did not warrant any intervention by security agents. “There was nothing political about the meeting. We wonder why they did that . . . but that won’t stop the process of moving towards real freedom and independence in the country. People will continue fighting. “We condemn in the strongest terms the behaviour of our security forces in this case and others, especially the CIO (Central Intelligence Organisation),” Gumbo said. He also revealed that security agents had got to the extent of locking gates at the church, disrupting the religious meeting. “We believe it is unconstitutional and illegal. This is not how security forces should act. “We view this as a serious violation of people’s rights. Churches are supposed to operate freely,” he said. According to some political analysts, Mujuru — who was sacked from Zanu PF and the government in 2014 on untested allegations of plotting to oust and assassinate Mugabe — is a major threat to Mugabe and the ruling party’s tenuous hold on power. Since her ouster, Mujuru has indeed appeared to cause Zanu PF bigwigs sleepless nights, with sources in the ruling party even claiming that several of their members “secretly” belong to the Mujuru camp. According to ZPP, while in the past violence victims were almost exclusively members of former prime minister Morgan Tsvangirai’s Movement for Democratic Change (MDC) party, in recent months the situation had shifted to include the ruling ZPF and Zanu PF members as well, owing to the ruling party’s seemingly unstoppable factional and succession wars. “As the reports for March show, intra-party conflict continues to be quite rampant across,” ZPP said, adding that some people were also resisting Zanu PF’s attempts at supremacy in some areas. “For instance in Mashonaland East, some chiefs protested against the (party’s) repressive instructions and orders. “This was also seen in at least two other instances where resistance to Zanu PF supremacy seems to be repeating itself in various corners,” the watchdog said. It added that human rights violations were continuing unabated as the country struggled to observe constitutionalism. “All in all, disregard for people’s freedom of assembly and freedom of expression as enshrined in the Constitution continued to be the order of the day for March as in previous months,” it said.